The best date movies out there are films that are one part romantic mixed with another part comedy. The mixture is great for dates (especially first dates) for numerous reasons. One reason is that is true is because these movies are light enough that you don't have to focus on the film. You can use the time to chat with your date or just absently watch the film without much effort. The best date movies make it easy to have a great time at the same time as alleviating any nerves associated with dating. If you're looking for a film to pick up for a great date night this weekend, check out some of these top romantic films that can make your date night even more enjoyable. In this popular Adam Sandler and Drew Barrymore movie, Barrymore's character gets a bout of amnesia every single night. As a result, she can never remember what happened the day before. Sandler's character ends up falling for her and tries to find a way around these barriers to convince her she was in love with him the day before. The sweet film features numerous jokes, great movie kisses, romantic moments and just enough plot line to keep you interested but not on the edge of your seat. One of the more classic 1980's films out there, Say Anything is the quintessential plot of two youths from different life paths who fall in love. She's a straight A student, he's just hoping to get by. Will their love be able to stand the test of time - or even high school? This film is a great date film because the plot is so simple you can see it coming - meaning there is plenty of time to talk to your date! This great comedy features two comedic masterminds in Meg Ryan and Billy Crystal. The two friends meet on a car ride shortly after college and keep running into one another. The two - at first - seemed destined for relationships with other people. He's engaged, she's dating someone and everything else is all off. But in the end of the film, the two come together and finally realize that life without a good love story isn't quite worth living. This film makes a great date movie as there is just enough dirty humor, classic jokes and gooey romance to keep both parties happy. Another classic John Cusak film, High Fidelity features Lloyd, the record store owner and his relationship. He relates to everything in the form of music - setting the perfect romantic situation right in the movie! Lloyd tries to work his relationship out and beat their problems to a pulp. But in the end, will he stop listening to the music and start listening to his heart? While Donnie Darkoisn't a romantic comedy per se, the film is just enough intellectual humor in the movie to pass for a great date night film. For some, there are scary enough scenes that you might be running for someone to hold - a great situation for your date! 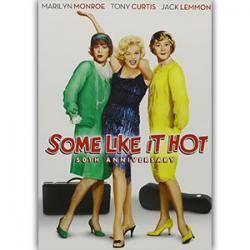 In addition to being a great classic black and white film, Some Like It Hot is a nice comedy for your next date. Two down and out guys have to go on the run after witnessing a murder. The two end up a part of a girl's singing circle and the comedy ensues. The film is great for laughing with someone you're trying to get to know! Whether you love action films or like to keep things romantic, there are plenty of features in most great date movies to please all interests. Just because the best date movies out there don't have large, giant fight scenes or action movie twists doesn't mean they aren't enjoyable! Grab a date, a great movie and have a fabulous night tonight!